The Serial analyzer sink decodes analog data on a serial bus to serial data. It can be used to monitor and analyze RS232, RS485, MIDI, DMX or other compatible serial buses. The serial analyzer can monitor up to eight sources. When these sources are in sync (all sources are of one (combined) instrument), all captured data will be displayed in chronological order. If Type is set to normal use rising, if Type is set to inverted use falling. If measuring on the data+ of the differential bus use normal, if measuring on data- use inverted. To control the behavior of the Serial analyzer sink, several properties are available. These can be accessed through a settings page in the output window. The Source selector determines which source of the Serial analyzer the settings page affects. The Default selection affects the set of properties that is used when a new source is connected to the Serial analyzer. For correct detection, the Bitrate property must be set to the correct value corresponding to the bus that is under measurement. It can be set to several common values, but also to an Auto detect value, where the Serial analyzer will determine the used bitrate. It is also possible to enter an arbitrary value in the bitrate edit field. For correct detection, the Databits property must be set to the correct number of data bits, corresponding to the bus that is under measurement. It can be set to several common values: 5, 6, 7 or 8 bits. For correct detection, the Parity property must be set to the correct value, corresponding to the bus that is under measurement. It can be set to several common values: None, Odd, Even, Mark or Space. For correct detection, the Stopbits property must be set to the correct value, corresponding to the bus that is under measurement. It can be set to two values: 1 or 2. For correct detection, the Mid level property must be set to the correct value, corresponding to the bus that is under measurement. The default setting is Auto level. To control the behavior of the Serial analyzer output window, properties and actions are available. These can be accessed through a toolbar with buttons at the top of the Serial analyzer output window and through a popup menu which is shown when the sink is right clicked in the Object tree. 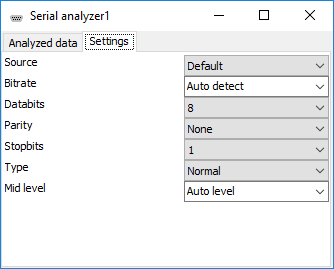 The Clear action ( ) clears the Serial analyzer output window. The Clear action is available as button on the toolbar. The Auto scroll to bottom property ( ) makes the Serial analyzer output window scroll to the bottom of its content each time new data has arrived, making the latest data visible. The Auto scroll to bottom property is available as button on the toolbar. The Export data action ( ) saves the content of the Serial analyzer output window to a text file. The Export data action is available as button on the toolbar. 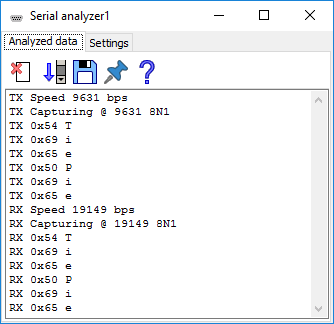 When the Always on top property ( ) is switched on, the Serial analyzer output window cannot be hidden under other windows of the Multi Channel oscilloscope software. The Always on top property is available in the popup menu.